Transport yourself to the year 2030. How will you communicate with your doctor? What tools will you need to make informed medical decisions? How will you commute to work or school? These are the types of future-oriented questions that the Health Leadership Academy’s Innovation by Design II (IBD) students explored this term. 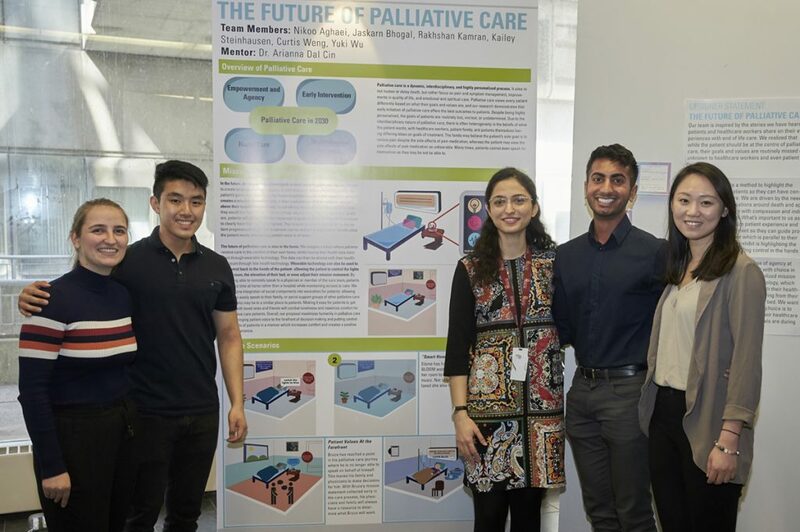 Following the introductory Innovation by Design course, students in IBD II worked with industry sponsors to design for future needs in four key areas of health – palliative care, autism care, health sciences education, and active transportation. 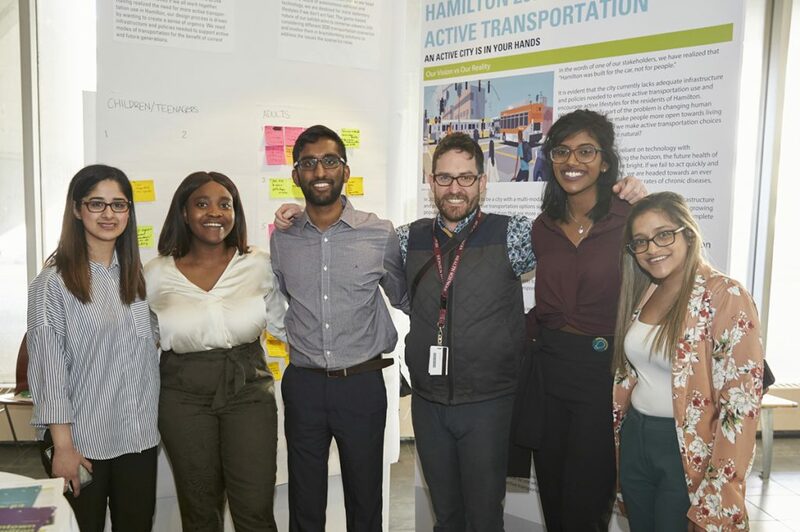 Last week, the four student teams shared their work in an exhibit at the Ewart Angus Centre on McMaster’s main campus. 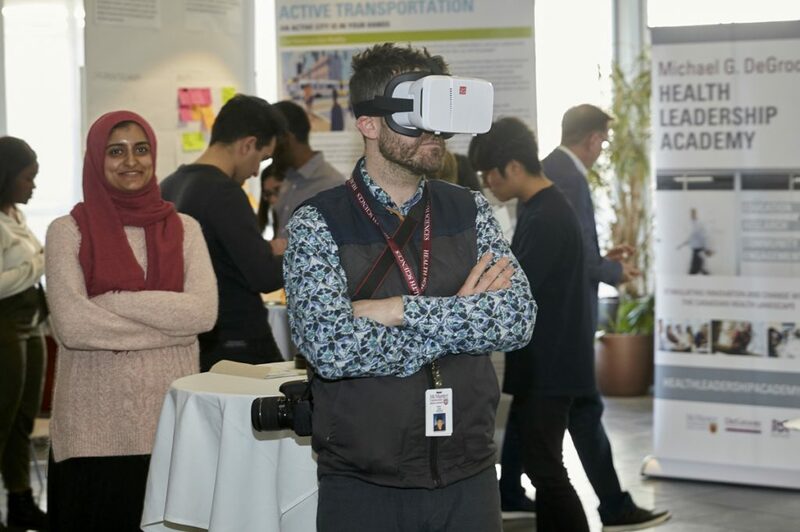 Dozens of researchers, health care practitioners, as well as McMaster faculty and students crowded around the interactive exhibit for a glimpse into the future of health. 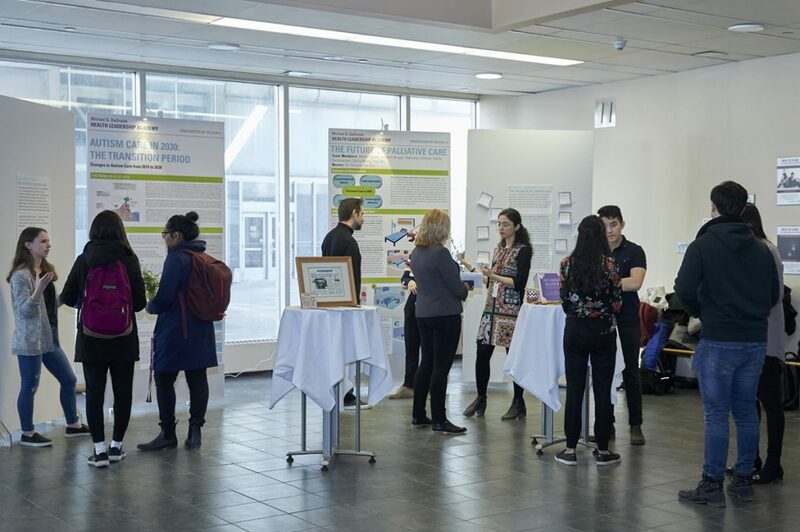 Attendees learn more about the future of health through an Innovation by Design student exhibit at the Ewart Angus Centre on April 3, 2019. Developed in collaboration with futurist Sanjay Khanna and the McMaster Museum of Art, the IBD student exhibit serves not as a forecast, but rather a series of imaginative prompts for conversation and action about what leaders and organizations need to do now in this time of disruption. The following are key insights from the exhibit that pinpoint areas of action for the health landscape. 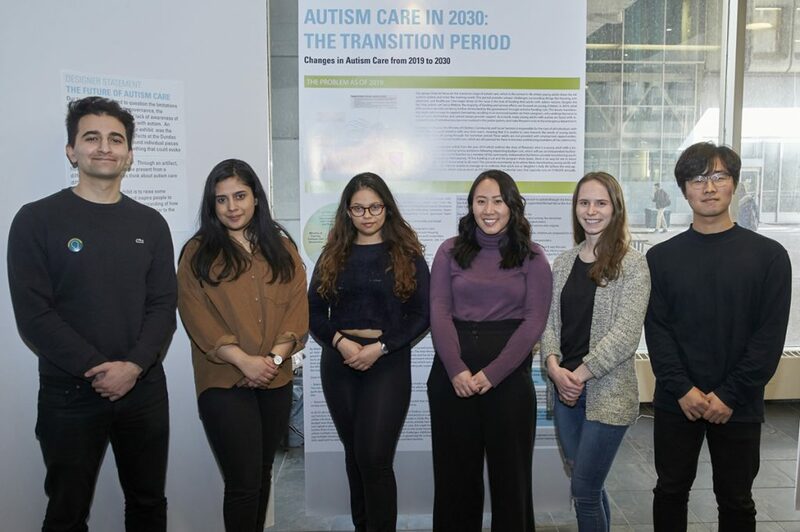 Working with Anna Kata and Stelios Georgiades of the McMaster Autism Research Team (MacART), this team found that current solutions for autism care are heavily focused on the entire spectrum, rather than catering to individualized needs. After consulting a range of stakeholders, this group questioned if employment programs could help provide adults with autism the skills they need to make a contribution to society. In addition, the group suggests that catering to individual needs could potentially reduce long term health care costs. 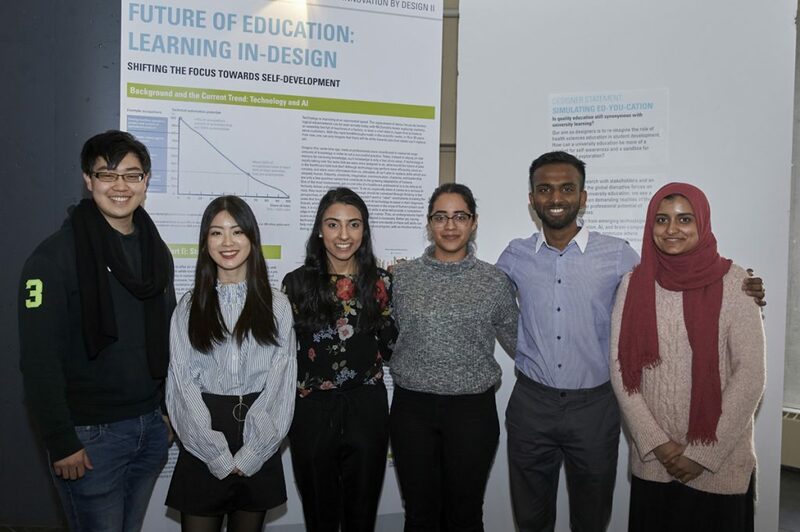 In partnership with McMaster’s Bachelor of Health Science Program (BHSc) and Stacey Ritz, this team of undergraduate students focused on the future needs of health sciences education. The group identified several megatrends through their work, including technological dependency in careers, increasing prevalence of chronic diseases, and a shift of health care toward wellness over illness. The students highlighted the future need to foster skills that are irreplaceable by Artificial Intelligence (AI). For example, the team raised the possibility of AI being used to enhance human interactions and connections and suggested a future in which BHSc students are required to learn about AI in their degree. Don Curry and the City of Hamilton’s Public Health Department are faced with the challenge of increasing physical activity levels of Hamiltonians through active transportation. Working with Curry on this challenge, the IBD team focused on emerging themes and concerns, such as the lack of transportation connectivity, political barriers, safety concerns, and other public push-backs. The group identified several weak signals that pointed to upcoming future disruptions including autonomous vehicles, changes in transportation infrastructure, the proliferation of virtual reality allowing for simulated walks, and the development of sidewalk lab neighbourhoods. Playing on all of these insights, the students’ exhibit featured a card game that asked users “think through various future scenarios and create their own solutions” – an interactive experience inspired by the Thing from the Future card game. Still consulting stakeholders, this card game is a unique way for the city to collect even more data and better understand the current population’s future view of transportation. Innovation by Design Instructor Sean Park steps into Virtual Reality during the exhibit at the Ewart Angus Centre on April 3, 2019.